Better invest some money into NICE-looking headphones than those ugly white cans... I can't believe so much people buy that austrian piece of crap just because of some girl... Can't help it i guess. Also, for the amps, you should try to use tubes. Because opamps are electronics and thus ruins the sound. Why would you spend so much money for things who destroy the pure analog sound ? Wow, just wow. Normally I don't comment on random blogs but this poster is so ignorant that I couldn't help it. 1.) People don't buy the K701 for looks (or some girl). 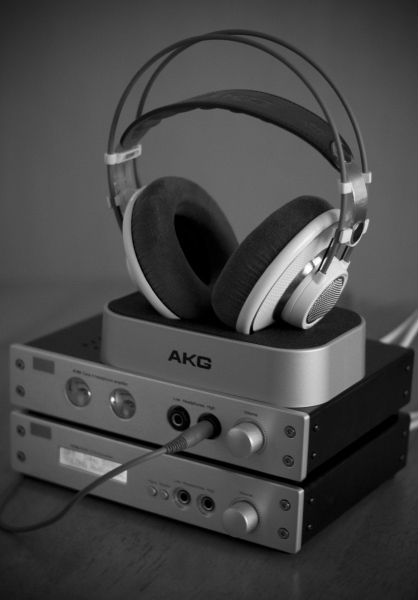 If the author was buying headphones for looks, it wouldn't be a $250 AKG. Making something look nice isn't THAT expensive. 2.) "opamps are electronics and thus ruins the sound". LOLwut. If you personally don't like a neutral sound signature, that's your opinion, but to say it "ruins the sound" is ridiculous. Some people (myself included) like to hear the music transparently, without hearing the electronics that are doing the work. Haven't heard of Objective2. Will look into that as a point of interest. I bought the A100 on the strength of project86's review on head-fi. It was a toss up between that and a Matrix M-Stage, but he suggested that the M-Stage had a darker kind of sound to it, and that the A100 was the more transparent of the two. If you have any suggestions for a tube amp and some quality Chinese headphones, I'm all ears. All products may have some ingredients that can cause damage to the parts or accessories.